Friends, colleagues, and champions of each other’s respective careers, artist Stan Brakhage and curator Sally Dixon had a life-long relationship. Their history of swapping letters and sharing neighborhoods, as well as the gifting of works and other ephemera, clearly demonstrated that there was many routes through which Crystal Clips — the Walker’s as-yet unidentified 16mm film believed to be a Brakhage “work in progress” — could have passed between Brakhage and Dixon’s possessions. As I mentioned before, Crystal Clips had been found among Dixon’s gift to the Walker of Brakhage 16mm and 8mm film cans. The original film can bore a typed-up sticky label with the title, a largely anonymous piece of information without any handwritten marks, although the wear and discoloration on the tape matched that of the neighboring Brakhage containers. 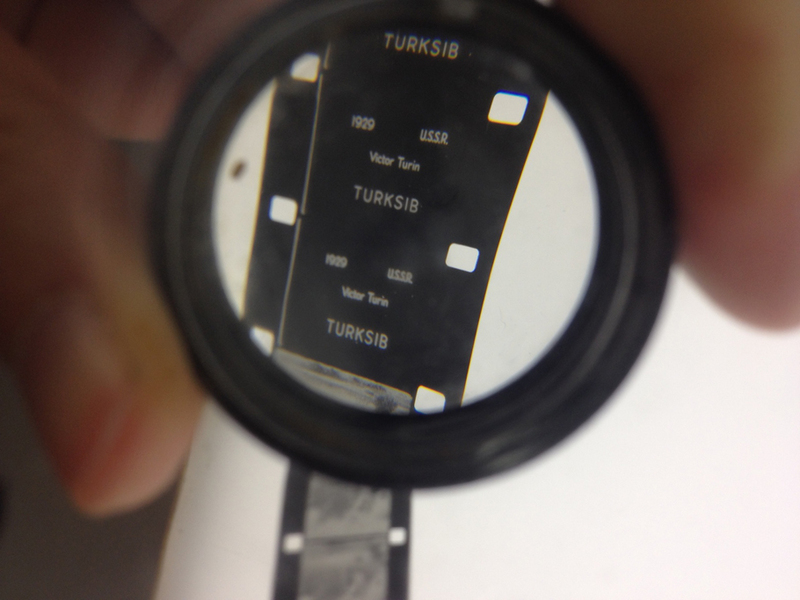 The 16mm film, meanwhile, had been transferred to an archive-safe can and stored in the Walker’s archive freezer so as to minimize the inevitable degradation to which all objects (celluloid or otherwise) are subject. After Crystal Clips was pulled from the archive freezer and spent three days thawing out, I went down to the Film/Video archive, a temperature-controlled room in the Walker’s basement, to meet Caylin Smith, the Bentson archivist. While Caylin unpacked the film, she pointed out a handwritten note she’d found accompanying the film. 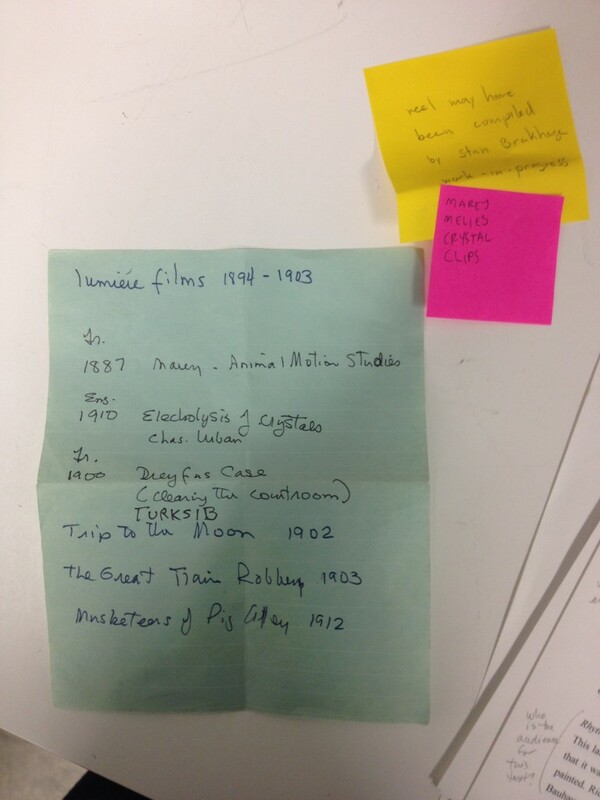 The paper was clearly the same type Sally Dixon often used in her own notes, and the writing — a list of films, which presumably was meant to correspond to the contents of the reel — likewise matched Dixon’s hand. Also included was a yellow Post-It written in the hand of Walker Archivist Jill Vuchetich, which most likely recorded a comment made by Sally Dixon at the time of the gift’s acquisition. Caylin booked a screening slot with Joe Beres, the Walker’s Film/Video projectionist, so we could see the film in the cinema. We’d have to wait for a quiet gap between the Walker’s regular print checks (when projectionists inspect the quality of the film or video material as it comes in from a distributor and prepare it for the public screening program) and the regular public screening schedule. Clearly a personalized edit of a longer reel, I wondered whether it had in fact been a teaching aid of some kind, rather than artistic material put aside for a “work in progress.” This educational use seemed possible, given that Brakhage’s first engagement with Dixon was via her invitation to lecture in Pittsburgh. I took a few reference photographs on my cell phone before the film was spooled up to pass on to the cinema and returned to the Walker’s main archive room to look through Dixon’s correspondence folders and consult publications of Brakhage’s writings and lectures held in the Walker’s library next door. All the arts, what we traditionally call the arts, have suffered from this breakdown of terminology, this lack of serious critique. Here is a discipline far older than any other we know of human beings, but when it’s taught in public schools, in fact in colleges, it’s taught as a playground for finger painting and for expressing yourself. He is going to climb this mountain by wrapping it with his footprints; he will come down again when he is halfway up, climb another mountain by way of digression, and then go back up the first one. He shows us that to be interested in anything we must be interested in everything. This kind of mind is not an American tradition. We are raised to respect conviction rather than analysis, persuasion rather than interpretation. 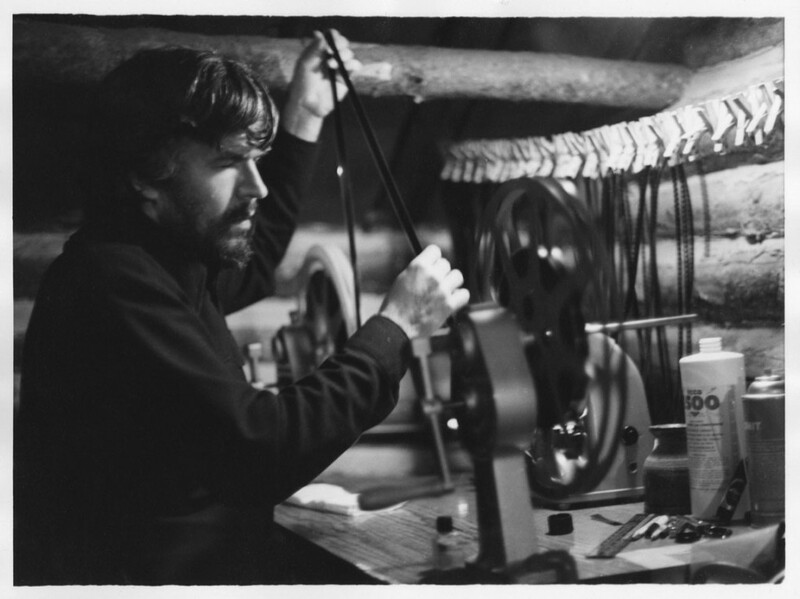 Brakhage uses up the average man’s portion of speculative thought every day. Analysis and interpretation was arguably key to both Brakhage’s and Dixon’s teaching styles, as they sifted through, ordered, and presented what was then a nascent history of artists’ moving image and established a context for their own practices. In the library, I read a first edition of The Brakhage Lectures (since reissued as a free pdf by Ubu Editions). Brakhage delivered these lectures at the School of the Art Institute of Chicago in the Fall/Winter semester of 1970–1971. As Ian Robertson’s afterword to the publication records, Brakhage screened 43 films, and it is this list of film works that were a key source in cross-referencing the films listed in the Crystal Clips reel and its accompanying note. Dixon’s notion of “gathering in” images and knowledge via travel and communication seems to me an apt description of Brakhage’s and Dixon’s own roles as primary disseminators of a new history of artists’ moving image work. And within this scenario, Crystal Clips had significant practical uses to both the artist and the curator. Both Brakhage and Dixon referenced these particular works frequently in their lectures and personal notes. The assigning of provenance to work is fraught with obstacles both practical and legal. While it’s not necessarily my place or responsibility to verify provenance, I can make some reasonable estimations based on the following: Dixon believed Crystal Clips to be from Brakhage when she gifted it on to the Walker; the discoloration of the can and the reel was similar to the degradation of her other Brakhage works; and Brakhage frequently donated works, books, and other ephemera that he though would be useful to her. The material on Crystal Clips itself, meanwhile, looked to be an extracted copy of a larger and more general reel that presented the history of early film. While examining the back catalogue of the Huntley Archives, another film distributor of early cinema, I found a reel with a similar composition of films. Crucially, the intertitles from Crystal Clips matched the typography of the Huntley reel, the latter of which was in general circulation for educational and reference purposes. In other words, evidence that the source material has a splice. If that’s true, this would lead me to think that this is a contact print of a “working print.” Stan could have complied the “working print” or he could have simply printed this copy for Sally, another aspect to think about. Once Joe the projectionist had found us a cinema slot, the Walker Film/Video department — Caylin, Sheryl Mousley, Dean Otto and Kate Rogers — assembled in the cinema to view Crystal Clips. Joe pointed out the traces of optical printing, while Dean noted how “dupey” the print looked — possible evidence of a small-scale reprinting, rather than something more industrial. In the cinema, it was clear that Crystal Clips was not a Stan Brakhage “work in progress” but most likely a custom-printed educational reel, shared between two friends who were also teachers. Despite the fact that the image is now heavily deteriorated, Crystal Clips races through the invention of cinema as a new visual culture in three compelling minutes. It specifically foregrounds the intersection dramatic narrative and technology — from the breakthroughs of E.J. Marey’s sequenced photographs of animal locomotion, to the construction landscapes of the Turkestan–Siberia Railway captured in Viktor Turin’s Turksib. As a film, Crystal Clips provides an illustrative role. Its historical contents rely on a guide, on supporting notes delivered by another voice that might unpack and describe the dense excerpts of cinematic innovation. But as an artifact within the Bentson Collection, Crystal Clips reveals something else. The work and expertise that goes into something as simple as following up a small note like “may have been compiled by Stan Brakhage / work in progress” not only shows the collaborative endeavor of archival research, but also exposes the informal networks through which artists’ moving image circulates both then and now: through the casual passing of hands, out of a common syllabus or a mutual interest, and a desire to share and exhibit an experience beyond one’s own intimate circle of enthusiasts and specialists. I like to share films with people. I think I’ve behaved in the same way that a person would if they saw some precious thing drifting out to sea. You try to rescue it.